A University of Washington oceanographer has helped create the first photographic atlas of the ocean floor. “Discovering the Deep: A Photographic Atlas of the Seafloor and Ocean Crust” (Cambridge University Press, 2015) was almost a decade in the making and contains more than 500 original illustrations and color photos, and access to online educational resources and high-definition videos. 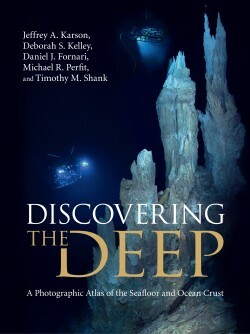 “Discovering the Deep” is now available for pre-order. Its pages contain a history of deep-sea science and a global tour of the volcanoes, hot springs, rocks and animals that exist in extreme environments in the ocean depths. “This book lets people see parts of the Earth that most of them have never seen or thought about before, and the processes that form fundamental parts of our planet — and it does it in a very illustrative way,” said co-lead author Deborah Kelley, a professor in the UW School of Oceanography. The book comes with endorsements from ocean explorer Robert Ballard; Kathy Sullivan, the head of the National Oceanic and Atmospheric Administration; and filmmaker James Cameron. Other authors are Jeffrey Karson of Syracuse University, Michael Perfit of the University of Florida, and Daniel Fornari and Timothy Shank of Woods Hole Oceanographic Institution.